Why “Well, Happy and Safe”? 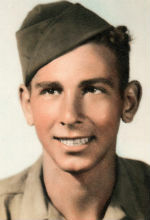 Today marks the 70th anniversary of V-E Day, the day my Uncle Babe missed by four days. He died on May 4, 1945, by drowning, apparently in a vehicle accident after the cease-fire between the Allies and Germans. That anniversary passed on Monday, and I failed to mark it because, for some reason, V-E Day stands out in my memory better than the date of my uncle’s death. I don’t have new information to share here today. Life in the past year has been quite hectic and I haven’t been able to devote the time I’d like to this project. I’ve finished transcribing Babe’s letters and I’ve not figured out the next direction to take this project. I have more paperwork to mine, so that may be where I go from here. At Farmingdale, N.Y.: Long Island National Cemetery, where Babe is buried. I started this nearly four years ago. The seeds for this project were planted decades ago, but they were cultivated further in March 2011. My parents, my wife and the rest of our family gathered that month in upstate New York for Bob Mauro’s funeral — my mother’s older brother, Babe’s younger brother. We have known him on this blog by the name Babe used for him: Bib. While we were all together in Mount Kisco, N.Y., for Bob’s funeral, my mother, father, wife and I drove to Farmingdale, N.Y., to the Long Island National Cemetery, where Babe is buried. We laid flowers at the gravesite, took pictures, talked and went on our way. The trip was tiring for my mother who was, at the time, still undergoing chemotherapy for endometrial cancer. She wore a wig, which she found extremely uncomfortable, but wasn’t particularly self-conscious about removing it from time to time. A few months after this trip, my mother died, on Aug. 6, 2011. Not long after, I took custody of Babe’s letters and personal effects. My father has since sent me additional documents he’s found. In December 2011, I started blogging the letters. I’m sure my mother would have approved. For me, she had been the keeper of family history and lore. She had a remarkable memory for details and was keen on listening and remembering names and places and events far better than anyone else I knew in my family. Regretfully, I have not inherited that knack, and with her death, there’s nobody else left in the family who remembers those kinds of details. Note: The photo above is not from Long Island National Cemetery. It is from Jefferson Barracks National Cemetery, about 40 minutes from where I live, in St. Louis County, Mo. The gravestone above right is, of course, Babe’s, from Long Island National Cemetery. Where Did Babe Fit Into the Mammoth Structure of the Military? Wondering About Mail Delivery: What Does a Postmark Mean?